“I read it on the internet” is not an authoritative statement proving that something is true. There are lots of things floating around out there that you may hear from friends or read online about cosmetic treatments and specifically, about Botox. It can be confusing (not to mention overwhelming) to try to sift through all of the information to really figure out what’s hype and what’s real. So on this page, we will go through and debunk the top five “Botox Myths” to help you understand what this treatment is and what it isn’t. This one is a bit of a stretch. It’s like saying “lifting weights will make me look like a bodybuilder”. There is a small grain of truth in that statement, but the overall message is just wrong. The truth is that Botox relaxes muscles. Very precisely, and only where you inject it. It works by binding to the receptors on the muscle that it’s injected into and blocking its chemical stimulation to contract. If it can’t contract, it can’t pull on the skin to cause a wrinkle and Voila! Your wrinkles soften or disappear. We could say Botox is magic, but again, there’s only a grain of truth to that one too! Nope. Not even close. There are actually seven types of Clostridium botulinum bacteria that are used in the production of Botox. What comes in that vial is a stringently purified protein complex that is known as Botulinum Toxin (type A), which is derived from the bacteria, not the bacteria itself. So this one is just plain false. To also emphasize how safe Botox injections are, think about this: more people have been harmed using Aspirin than Botox! And that really is true. This one is really semantics, but it bears clarification. Because Botox works by preventing the facial muscles from contracting, it only prevents wrinkles by a secondary effect. It’s really the muscle action that can prevent the wrinkle from forming—not the Botox. Maybe that’s splitting hairs, but we are being factual here! Pain is subjective and as such, every person may have a different perception of what is painful. 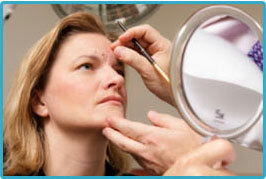 Let’s tell you a bit more about Botox treatment and see what you think about this one. The needle that is used to inject Botox is not much bigger than an acupuncture needle. Most patients who get Botox do not require any form of anesthetic, but for those who need it a topical numbing cream or ice pack can be applied prior to treatment. By these standards, getting bloodwork done is more painful than having Botox injections. This is kind of like saying that having your walls painted will ruin your floors. It’s true only if the person doing it is careless or doesn’t know what they are doing. A drooping eyelid, known as ptosis, is a very rare, reversible yet unwanted side effect of having Botox injections. The key to avoiding ptosis after having Botox is to have someone with the proper training, education and experience do your injections and to make sure you follow all of their recommendations afterwards. We hope we’ve given you some very good, factual and useful information to consider if you’re thinking about having Botox injections. And now, when you hear one of these myths repeated, you can authoritatively correct them and say that “you read it on the internet”! Contact us to schedule a FREE Botox consultation!